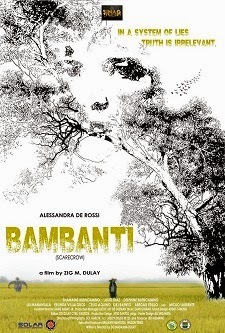 Bambanti, when translated in English, means scarecrow. It is also a festival in Isabela province where the film is set, a festival coupled with dancing and a colorful façade. A scarecrow scares birds based on its outside appearance, with the birds thinking that it’s some kind of monster, thus preventing them from getting to the harvest. It is the perfect metaphor for the story of this film about making judgements based on outside appearances. The premise of the film is simple. A dirt-poor mother and her boy who have been doing chores for their relatives (in-laws to be precise) as a means of earning money were in the wrong place at the wrong time. About 20-30 minutes into the film, a golden watch disappears, accusations are hurled, and the boy, a known prankster, was highly suspected to be the culprit. This situation alone would bring to mind the Filipino short story “Ang Kalupi” by Benjamin Pascual, where a dirty-looking boy gets accused of stealing a woman’s purse and eventually gets killed. The purse in question was discovered to be sitting in the pocket of the woman’s clothes at home. Now, halfway through the film, I kind of knew who the culprit was but still this rural drama engaged me. The film stars Alessandra de Rossi (Belen), Popoy (Micko Laurente), Shamaine Buencmaino (Martha), Delphine Buencamino (Martha’s daughter), and Kiki Baento (teacher). In all of Zig Dulay’s films (1017, Missing, M., etc. ), the consistent element is that of social realism. In this film, we are reminded of two judgements which we are sometimes (often for some people) guilty of: Poor people are prone to stealing and that someone who has an ill-repute (whether proven or not) probably did the bad deed. We are also reminded of our pride such as pretending to be nonchalant when we see the person we hastily judged instead of apologizing and admitting that we had committed a mistake. This film has shown hubris at its finest, as shown in the last frame where Aling Martha and her daughter had this guilty look in their eyes as Belen and her son passed them by during the Bambanti festival, but proceeded to turn their away and enjoy the festival anyway. On the technical aspect, this film was definitely a deserving contender for the best cinematography, with its glorious aerial shots, particularly in the fields. The light exposure was just right even in some scenes where it is shot under direct sunlight or in the interior. The images were crisp, as crisp as the truthful performances of the cast members. Each character is well-defined and relatable. *For me, this film was the best of the bunch (Sinag Maynila 2015 entries). This rural drama was compelling, relatable, engaging, and you can definitely feel for the characters. Truth is indeed irrelevant when one is already a prisoner of stereotyping and judgement based on one's social status. *As compared to Swap, Imbisibol, and Ninja Party. I was part of Balut Country so it is biased if I include it in the comparison.